Composed from two symposia conducted at the 2001 Annual Meeting of The American Ceramic Society, this new volume details the advances in the state of knowledge in nuclear and waste materials science and technology. Highlighted are areas of rapid change such as in the application, development, and testing of ceramics and glasses in the nuclear and waste industries. As companies begin to focus on ¿green ceramics¿ and the manufacturing of environmentally friendly products, the development of innovative processing approaches and novel environmental treatment technologies soon follows. These are being developed to address more stringent regulations and to obtain an improved scientific understanding of the industrial processes and treatment technologies. This seventh volume in the series addresses current nuclear and environmental problems and provides solutions for them. 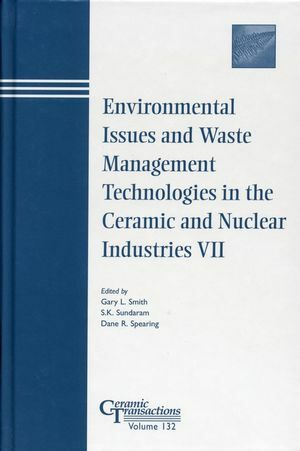 It is an excellent resource for researchers and scientists involved in the ceramic and nuclear industries. roceedings of the symposium held at the 103rd Annual Meeting of The American Ceramic Society, April 22-25, 2001, in Indiana; Ceramic Transactions, Volume 132. Refractory Recycling-Concept to Reality (J.P. Bennett and K.S. Kwong). Recycling of Aluminum Dross to Sialon-Based Ceramics by Nitriding Combustion (S. Kanehira and Y. Miyamoto). Recycling of the Waste Waters into Porcelainized Stoneware Ceramic Tiles: Effect on the Rheological, Thermal, and Aesthetical Properties (F. Andreola, L. Barbieri, I. Lancellotti, and T. Manfredini). Mineral Processing Techniques for Recycling Investment-Casting Shell (C.L. Dahlin, D.N. Nilsen, D.C. Dahlin, A.H. Hunt and W.K. Collins). Environmental Treatment Technology and Policy. Exposure to Crystalline Silica in the Italian Ceramic Tile Industry: Present State and Future Prospects (G. Timeellini and C. Palmonari). Managing Potential Ceramic Fiber Health Concerns Through Technology and Product Stewardship (B.K. Zoitos and J.E. Cason). Characterization of Defense Nuclear Waste Using Hazardous Waste Guidance. Status of the Evolving Process at Hanford (M. Lerchen, G.K. Patello, D. Blumenkranz, K. Wiemers, L. Huffman and J. Yokel). The European Ceramic Tile Industry and the New Approach to Environmental Protection (C. Palmonari and G. Timellini). West Valley Demonstration Project: Vitrification Campaign Summary (R.A. Palmer and S.M. Barnes). Waste Glass Processing Requirements of the Hanford Tank Waste Treatment and Immobilization Plant (G. Mellinger, L. Holton and N. Brown). Influence of Glass Property Restrictions on Hanford HLW Glass Volume (D.-S. Kim and J.D. Vienna). Vitrification and Testing of Hanford Pretreated HLW Sludge Mixed with Flowsheet Quantities of Secondary Wastes (G.L. Smith, H.D. Smith, M.J. Schweiger and R.J. Bates). Vitrification and Testing of Hanford Pretreated Low Activity Waste (G.L. Smith, H.D. Smith, M.J. Schweiger and G.F. Piepel). Corrosion of Ni-Cr Alloys in Molten Salts and Hanford LAW Waste Glass (I. Vidensky, H. Gan and I.L. Pegg). Technology Roadmapping Focuses Vitrification at the INEEL (J. McCray, C. Musick, A. Olson and K. Perry). Glass Formulation for Direct Vitrification of INEEL Calcine HLW by J.V. Crum, J.D. Vienna, D.K. Peeler and I.A. Reamer The Cold Crucible Melter: High-Performance Waste Vitrification (A. Jouan, R. Boen, R.D. Quang, T. Flament and G. Mehlman). Millimeter-Wave Monitoring of Nuclear Waste Glass Melts-An Overview by P.P. Woskov, J.S. Machuzak, P. Thomas, S.K. Sundaram and W.E. Daniel Jr. Cold Cap Monitoring using Millimeter Wave Technology (S.K. Sundaram, P.P. Woskov, J.S. Machuzak and W.E. Daniel Jr.). Furnace System Development for the Plutonium Immobilization Program (A.D. Cozzi, K.C. Neikirk, D.T. Herman, J.C. Marra, T. Pruett and J. Harden). Plutonium Immobilization Project Phase 2 Cold Pour Test (M.E. Smith and E.L. Hamilton). Real-Time Determination of the Redox State of Glasses-Direct Potentiometry vs. Chemical Analysis (D.D. Siemer and J.A. McCray). Crystallization in Nuclear Waste Forms. Crystallization in High-Level Waste Glasses (P. Hrma). Effect of Crystallization on High-Level Waste Glass Corrosion (B.J. Riley, P. Hrma, J. Rosario and J.D. Vienna). The Effect of Glass Composition on Crystallinity and Durability for INEEL Run 78 Calcine Waste Simulant (J.V. Crum, J.D. Vienna, D.K. Peeler, I.A. Reamer and D.J. Pittman). Long-Term Corrosion Tests with Hanford Glasses (W.L. Ebert, M.A. Lewis and N.L. Dietz). Dissolution Kinetics of High-Level Waste Glasses and Performance of Glass in a Repository Environment (Y.-M. Pan, V. Jain and O. Pensado). Analysis of Layer Structures Formed During Vapor Hydration Testing of High-Sodium Waste Glasses (A.C. Buechele, F. Lofaj, C. Mooers and I.L. Pegg). Kinetics of Alteration in Vapor Phase Hydration Tests on High Sodium Waste Glass (X. Lu, F. Perez-Cardenas, H. Gan, A.C. Buechele and I.L. Pegg). TCLP Leaching Prediction from the 'THERMOTM' Model for Borosilicate Glasses (J.B. Pickett and C.M. Jantzen). Effect of Glass Composition on the Leaching Behavior of HLW Glasses Under TCLP Conditions (H. Gan and I.L. Pegg). Chemical and Physical Characterization of the First West Valley Demonstration Project High-Level Waste Feed Batch (R.A. Palmer, H. Smith, G. Smith, M. Smith, R. Russell and G. Patello). Alternative and Innovative Waste Forms. Aqueous Based Polymeric Materials for Waste Form Applications (L. Liang, H. Smith, R. Russell, G. Smith and B.J.J. Zelinski). Performance of Hydroceramic Concretes on Radwaste Leach Tests (D.D. Siemer). Cerium as a Surrogate in the Plutonium Immobilized Form (J.C. Marra, A.D. Cozzi, R.A. Pierce, J.M. Pareizs, A.R. Jurgensen and D.M. Missimer). Release of Uranium and Plutonium from the EBR-II Ceramic Waste Form (L.R. Morss and W.L. Ebert). Monitoring Consistency of the Ceramic Waste Form (M.A. Lewis and W.L. Ebert). Impurity Effects in Titanate Ceramices for Advanced PUREX Reprocessing (E.R. Maddrell). An Investigation of Sintering Distortion in Full-Size Pyrochlore Rich Titanate Wasteform Pellets Due to Rapid Heating to 1350°C in Air (P.A. Walls, J. Ferenczy, S. Moricca, P. Bendeich and T. Eddowes).